"Writers are people for whom writing is more difficult than it is for other people." "on the QT" or Quick Take, presents for consumption and comment random observations of life in the present. Debating whether there is a God or not is a fool's endeavor unless it/he/she shows his hand. Nevertheless the time has come to rigorously critique Darwin's theory of evolution/natural selection. Darwin knew nothing of genetics, nothing of cellular organization, nothing of organic chemistry, almost nothing of paleontology, no idea of the true age of the earth, and only a superficial qualitative understanding of statistical analysis. Yet, his theory is taught in schools to the exclusion of any other hypothesis. This is important since the more we learn about the complexity of living organisms, the more tenuous his theory becomes. Given we'll most likely never know our true origin or history for lack of evidence, we should try to find comfort in whatever we choose to believe and leave it at that. Enter the contest to win! Paypal recently announced that they will be exploring the concept of "space payments," with the expectation that space tourism will take off in the next decade, and humans will then need to pay for things while in space and be able to send payments back to earth. They need look no farther out than the Phrenicea website(! ), as we have proposed over a decade ago that there will not be any need for money in the future. Phrenicea will facilitate financial transactions which will then be recorded forever on a man-made 24th-chromosome pair, colloquially referred to as "brainerama." All the world's coin, currency as well as electronic funds will be replaced with what will commonly be refered to as "soma-cash" or "tissue-issue." "Almost everyone's financial assets and liabilities will become part of his physical body, accessible to Phrenicea via its engagement to effect transactions for the transfer "DiNAs," the DNA-based unit of wealth." If you are reading this it is quite remarkable. There's an estimated 180 million websites worldwide and the number is growing daily. So how did you get here? Was it Google? Another search engine? Random web surfing? The Phrenicea website has been online since 2000 and has garnered respectable visitor traffic despite non-commercial and esoteric content. But these might be considered its good-old-days in terms of what the Internet marketing experts call "eyeballs." Why? Because the Internet is growing exponentially in size. So, we're honored and happy to have you with us today. With all of your ever increasing distractions and everyday activities competing for your time, we may never have you join us again! In General Motors' heyday its chairman Charles Wilson uttered the famous phrase, "What's good for the country is good for GM and vice versa." Wilson's self-serving declaration in the early 1950's is still apt today, albeit within the ironic context of government bailouts. GM leveraged its brand equity to excess — yielding five tarnished, almost fungible nameplates. Saturn, wasting billions in the process. (Imagine if all that capital was applied instead to advanced hybrid technology.) And not many it seems are forgetting the dismal reputation it earned so well for shoddy workmanship. These days GM's cars are better built while it hopes to soon shock us with the new plug-in Volt. But it will take as many years to repair the company's reputation as it took to squander it. Most would rather just play it safe with a Toyota, Honda or Nissan. General Motors and the other U.S. car manufacturers arrogantly underestimated the intelligence of consumers. What's is good for the country is good for a foreign company — a reality euphemistically touted as "globalization." It's about time! Green 1.0 failed because it relied on objective scientific data and rational pleas. Green 2.0 is the result of through-the-roof gas and oil prices and subjective outrage. Green is cool (no pun intended). Let's hope it's more than a fleeting fad. 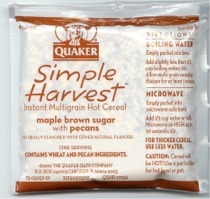 Always on the lookout for convenient yet healthy foods, I was delighted to find Quaker Oats finally came out with a single-serving instant oatmeal without artificial ingredients, as part of their new whole grain "Simple Harvest" line. Unable to throttle my excitement, I quickly snatched six boxes from the supermarket shelf. A long-time fan of their original "classic" instant, even with its sweet artificial flavoring, I eventually learned to reduce my early-morning sugar hit by skillfully sifting out of the bowl almost two tablespoons of sugar — and it still was too sweet. So the Big Question was, Would I be able to skip this ritual with this new healthier variant? "That's one small step for nutrition, one giant leap behind for waste." immediately tempered. 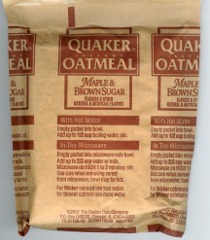 Instead of a simple brown paper packet used for years with the not-so-natural version, the new package is made of environmentally unfriendly plastic. Made even more ironic then was their declaration of responsibility printed on the box, "At Quaker, we're committed to reducing our environmental impact through creative solutions for minimizing waste — like using oat hulls as a renewable resource." As I see it, this is "One small step for nutrition, one giant leap behind for waste." On a more positive note, the answer to the Big Question is: Simple Harvest is a lot less sweet — only a tiny bit of sifting is now required. Recently I had the opportunity to visit New York's Metropolitan Museum of Art, a wonderful place to view and appreciate man-made artifacts going back to at least 1000 BC. It makes you realize that human intelligence is not unique to modern times — which we tend to discount. Although the entire museum is impressive, particularly stunning is a 4th century BC marble column (reduced from its original height) prominently displayed in the Ancient Greece section of the museum. The detailed carving of the stone boggles the mind as to the amount of time spent hand chiseling to create the capital's foliate ornaments and the fine scale pattern at the base. Incredible too is that these massive objects were erected and maneuvered into position without modern machinery. And to think, it was interminable idle time that in effect produced much of the museum's collection of timeless art. Fortunately BC was before the PC and today's hectic pace; otherwise the museum might be almost empty! With all of our technical prowess — what are we creating today that will be around in 2,500 years — other than waste plastic and mega-tons of carbon dioxide? As in the August 24th QT below, this installment is inspired by googling on Google. Another alert visitor discovered that when he miss-keyed phrenicea with the suffix ia instead of ea, Google's response was, "Did you mean: Phrenicea." Intrigued, I tried several misspelled words to see if Google would attempt to correct my fumbling fingers. "Did you mean: House" was the result of entering houce. "Did you mean: architecture" was the result from entering arciteckture. "Did you mean: Google" was the result of entering gogle. Given that Google recognizes legitimate words and apparently considers this website a distinct entity; Will it, or perhaps an eventual successor, one day replace Webster's as the official arbiter of wordhood? Will prosaic hardware and software replace human judgment to become the new authority as to what are acceptable words for mortal communication? I usually side with flesh-and-blood humans — but in this case I'm betting my chips on the lifeless, silicon-based server farm. So long, farewell, auf wiedersehen, goodbye Mr. Webster. Swapping emails recently with a new visitor of Phrenicea revealed she had found us by googling the phrase 21st century future. Intrigued, I tried it and was astonished that Phrenicea placed seventh out of 49,500,000 sites. Given that Google employs the brightest minds and is perceived to be the number one search engine — why would they bother serving up a list of almost 50 million websites, a ridiculous result beyond the practical ability for any human to consume? Talk about having too much information! It will be interesting to see if Google eventually rectifies this absurdity or perhaps this leaves open an opportunity for another innovative startup. Our May Two-Cents weblog essay discusses the increasing use of the "2.0" suffix originating from the term Web 2.0, which implies "this is what's next." Spotted so far in the popular media: "Banking 2.0," "Organic 2.0," and even "Mitt Romney 2.0." Here I'd like to coin [no pun intended] another variation; "Trash 2.0." As inflation eats away at the value of our currency, particularly low denomination coin, I've been coming across more and more pennies, nickels and even dimes at my feet — as it's apparently not worth it (or too embarrassing) to bend over and pick up what was once considered good luck as well as a tiny windfall. "Pretend you were to pay $1/gallon the next time you take a shower or bath, brush your teeth, flush a toilet, wash the dishes, or God forbid — water the lawn! Begin to use less water than the average person. Set an example. Prevent H2Ouch!" © 2007 Baby Blues Partnership. Reprinted with Special Permission of King Features Syndicate. Did Zoe and Hammie's tub really have to be filled to the brim? There's a lot of hype these days about hybrid cars. I guess that's a good thing. It's a bit confusing though, since there are several configurations including gasoline/electric, hydrogen/electric, and plug-ins. Each approach has its disadvantages, be it cost, range, or practicality. For example, hydrogen power sounds great — its byproduct is drinkable water! But the reality of storing hydrogen and distributing it is not trivial, and could even be dangerous. Plug-ins sound great too but their range is very limited. And I'm not sure if transferring the energy source to the centralized power grid is really smart, since most power generators are driven by fossil fuel. That just changes the source of pollution from tailpipes to smokestacks. I believe our best bet is leveraging the sun and the existing power grid already connected to most sources of consumption. If solar cells could be made efficient enough, each user would likely produce more energy than consumed, making the grid a practical receiver as well as supplier of energy. This is not a pipe dream. Consider that the sun for billions of years has essentially been the sole energy source for life to emerge, survive and evolve on earth. Now it's up to us to become smart enough to capture this abundance of potential, which for the most part is wasted as radiant heat. Even the peripatetic auto might one day become an energy source. Witness the sensation you feel as you put your hand on a car's paint on a sunny day. Imagine if that paint could convert the sun's rays into electricity, not unlike a tree capturing photon energy via the chlorophyll in its leaves. A car would most times be able to store more energy than it consumed. Multiply that by the millions of cars on the world's roads and plug-ins could conceivably feed the grid as well. What we must do is lobby for a crash program for research, development and deployment of solar technologies that try to equal nature's ability to utilize energy that's free for the taking. That would be energy well spent. It's amazing what people will auction and buy on eBay these days. I recently stumbled upon an auction for a RCA TV ad from 1967. Not the TV, but an old magazine ad touted as "Suitable for framing." Wow! Intrigued, I did a few searches on the vintage TV. Imagine paying $2000 for a TV in 1967 (a small fortune), where state-of-the-art was a 23" screen, stereo speakers on each side and a remote control button. Wow! 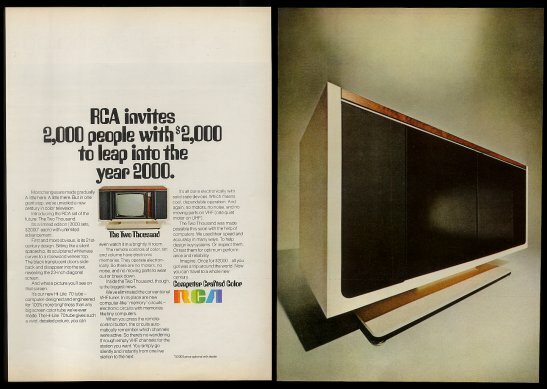 Introducing the RCA set of the future: The Two Thousand. First and most obvious, is its 21st-century design. Sitting like a silent spaceship, its sculptured whiteness curves to a rosewood veneer top. The black translucent doors slide back and disappear into the set, revealing a 23-inch diagonal screen. And what a picture you'll see on that screen. It's our new Hi-Lite 70 tube—computer designed and engineered for 100% more brightness than any big screen color tube we've ever made. The Hi-Lite tube gives such a vivid, detailed picture, you can even watch it in a brightly lit room. The remote controls of color, tint and volume have electronic memories. They operate electronically. So there are no motors, no noise, and no moving parts to wear out or break down. We've eliminated the conventional VHF tuner. In its place are new electronic circuits with memories like tiny computers. When you press the remote-control button, the circuits automatically remember which channels were active. You simply go from one live station to the next. The Two Thousand was made possible this soon with the help of computers. We used their speed and accuracy in many ways. To help design key systems. Or inspect them. Or test them for optimum performance and reliability. Imagine. Once for $2000 , all you got was a trip around the world. Now you can travel to a whole new century. Wow, that's exclusive all right — providing a certain entitlement to boast. Legend has it that Elvis had several of them, and even shot the screen out on one of them. Ah, what trivia you can learn on the Internet. With industry leading 16-bit color reproduction, the super-size TH-103PF9UK provides stunning widescreen progressive display featuring full HD pixel resolution of 1,920 horizontal x 1,080 vertical, a contrast ratio of 5,000:1, and 4,096 equivalent steps of color gradation, delivering clear, crisp and impactful fast action video images. 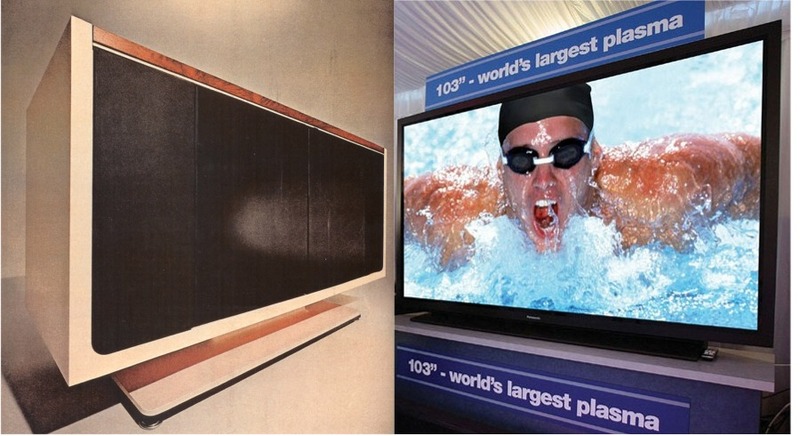 This 1080p display�s screen resolution, which amounts to about 2 million pixels, equals twice the resolution of high-definition televisions that are commonly available today. The TH-103PF9UK can display 1080/60p/50p, 1080/60i/50i/24p/24sF/25p/30p, 1080/50i, 720/60p/50p 480/60i/p, and 575/50i/p video signals. As the largest member of Panasonic�s high-performing professional plasma display family, the TH-103PF9UK features three interchangeable, multi-function slots (in the back panel) which allow users to add and update their panel with different combinations of optional terminal boards for a variety of applications. The 103� plasma display comes standard with the TY-FB9DD DVI board (compatible with UXGA input), TY-42TM6A analog component board, an integrated D-sub15 PC input, and an integrated D-sub9 RS232C interface. Optional plug-in boards assure expanded connectivity, including HD-SDI and DVI, as well as a variety of advanced functionality including monitor control, networking, running of internal applications and data storage, and remote signal playback. Wow, memorize that for the water cooler or watering hole! Technology changes, but not much else. Imagine how foolish you too would appear some 40 years hence spending all that dough today on such a tiny plasma TV. "The phrase 'Pot calling the kettle black' is an idiom, used to accuse another speaker of hypocrisy, in that the speaker disparages the subject in a way that could equally be applied to him or her. In former times cast iron pots and kettles were quickly blackened from the soot of the fire, so it seems ridiculous of the pot to call the kettle black." In modern times we also have the pressure cooker of bad publicity. The latest issue (March '07, page 16) of Consumer Reports investigates "An Accident Waiting to Happen," whereby "To save money, airlines [here the kettles] have outsourced many of their operations, from baggage handling to on-board catering... and work to maintain planes — fixing wheels, repairing engines, and more." What the magazine (now the pot) didn't report was its own use of outsourcing. It had to retract its January 18 article (February '07 issue, page 12) containing an inflammatory report on the safety of infant car seats. In an email to subscribers, Jim Guest, president of the magazine apologetically explains, "Some of the questions I've heard involve our use of an outside lab to conduct the crash tests... [W]e sometimes use outside contractors..."
So it appears the now black-marked magazine has "waiting to happen" certain lawsuits by the seat manufacturers. I guess some of those old sayings (idioms) from former times will continue to be relevant even in the microwavable present. "Due at U.S. dealerships in March, the '08 [Porche] Cayenne sport utility vehicle will be available..."
"Ford Motor Co. says it has lowered the prices on its face-lifted 2008 Ford Escape and Mercury Mariner. They go on sale in the first quarter." Here we are barely two months into the new year and some 2008 cars are already going on sale. If this keeps up we'll have our cars several years by the time the calendar year finally catches up with their model year, and the definition of "new" and "old" will blur. Isn't it pathetic that a professor has to resort to such obfuscation to avoid malicious spiders searching for email addresses to flood them with spam? What a sorry state of affairs that whatever technology is developed for good and productive purposes is hijacked by individuals bent on greed or just plain unscrupulousness. I shudder to think about at what lengths we'll have to go to thwart these despicable perpetrators of deception as technology marches on. Will the disadvantages of technology advancement eventually outweigh its benefits? I'm an "On This Day" in history buff. Imagine that 47 years ago, on January 2, 1960, Senator John F. Kennedy of Massachusetts announced his candidacy for the Democratic presidential nomination. Now you have to remember that the election was held on November 8 of that same year! It's hard now to fathom a presidential campaign beginning in the same year as the election, although it sure would be a welcome regression. What has changed in the years since that time to cause us to have to endure a campaign for president beginning two years before the election? Already the pundits are debating whether Obama will trump Hillary; or if Guiliani has an edge over McCain. Does anyone care yet? Perhaps it's the same reason why we're already seeing bathing suits on display at the mall. We're living our lives in future mode, which along with our constantly-connected-and-in-touch gadgets makes for one hectic ride. I long for the slower pace of the "Good Ol' Days," when the present really was the present, and not months or years into the future. Jeff Stahler: © Columbus Dispatch/Dist. by Newspaper Enterprise Association, Inc.
'Tis the season to receive countless holiday catalogs in the mail. 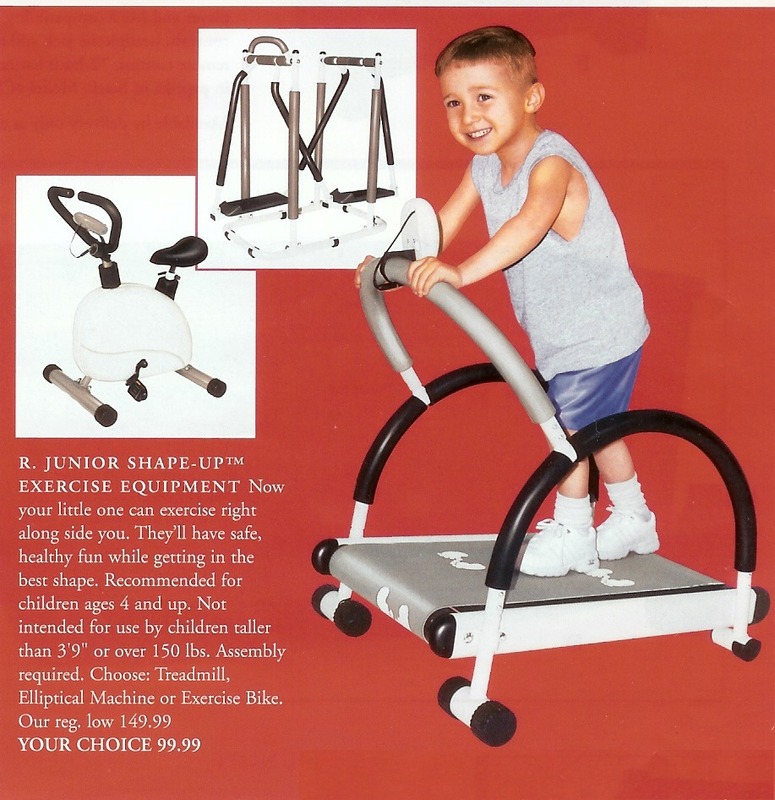 Although most of them immediately find their way to the recycle bin, I could not help but notice the most ridiculous gift ensemble to date: "Junior Shape-Up Exercise Equipment" consisting of a treadmill, elliptical machine and stationary bike designed for children "4 and up." It's bad enough adults who are health conscious have to subject themselves to non-productive indoor torture to make up for all the "labor saving" devices invented in the last 60 or 70 years. It's bad enough too that so many teenagers should be using exercise machinery instead of playing with today's computers and electronic gadgets. Now, children as young as four years of age will be encouraged to abandon natural play to exercise on machines. Most adults can't muster the discipline to use exercise equipment for anything more than a convenient station to drape clothing. Imagine a very young child with an attention span of seconds. You can be sure though that there'll be plenty of silly parents coughing up the $100 (sale price!) for each. Why not donate that money to charity instead and buy the kiddies an inexpensive sled, ball, (motorless) scooter, or a real bike — and let them be kids at least until they're eight or nine. Below is an actual email from a colleague who will remain anonymous. Just six months ago he was bragging about his brand new Infiniti's key fob that allowed him to start the engine just by pushing a button on the dash, as long as the fob was somewhere near the car. "So I went to the collision shop at 8am to pick up my car. Only one problem. They couldn't find the keyfob. But, the car starts. So, it must be in the car — although they searched it. I told him he had to find it, or anyone could take the car. He got all of his shop personnel to look for it. It had slid under the passenger front seat into the heater duct. They removed the passenger seat to find it." Now in the not-so-old days before all the fancy electronics, the service staff would have to keep track of where the key was, since it would have to be inserted into the ignition. This is just one humorous story, and unintended consequence, of technology used for technology's sake, and not necessarily to make our lives simpler or better. I would expect that these types of unfortunate but humorous stories will become more common as technology marches on. Gauging from early voting in our current Phrenicea Quikpoll#23, it's becoming apparent that the majority of voters dismiss concerns over potential health risks associated with the use of cell phones and their emitted radiation. At the same time, people talk about the danger of living or working near cell phone towers due to electromagnetic pollution. "We're not going to put ourselves and especially our kids at risk from something that might cause cancer or other problems," is a typical assertion. Isn't it curious that people exhibit this NIMBYism and oppose the installation of cell phone towers near their back yards, yet they have no concern whatsoever about their family's use of phones that are literally stuck to the sides of their heads — and communicating with these towers via microwaves! Is it only me or does the sight of an airliner in the sky still evoke the horror of 911; a flying weapon of mass destruction? Perhaps it's time to change that silhouette — maybe to a delta-winged craft resembling the space shuttle. It's been about 50 years since the first modern jet airliner appeared on the horizon (so to speak) and nothing much design-wise has changed since. That's the same time span as from 1910 to 1960! Check out the design of planes from the WWI period vs. the 1950s — that's from triplanes to the famous Boeing 707. Have we stagnated or what? Volkswagen announced the name of its new compact SUV will be Tiguan, which is coined from the words tiger and leguan (German for iguana). A tiger-iguana hybrid? What were they thinking? It's better than yet another IX, GX, QX, PX, LX letter combination. But really, a tiger and an iguana? Ouch! It's a good thing Phrenicea, the name of this website, coined from the words phrenic (of the mind) and panacea (cure all), is a registered mark. Imagine driving around in a Phrenicea! That's almost as tongue-tying as Chevrolet! News reports indicate that so far our driving habits have not changed much since the price of gas hit three dollars and more. Other habits appear to be changing however. Personal observations at the pump reveal that many are not filling up, but are frequenting the stations with $20 cash purchases. I even witnessed a $10 transaction which was adeptly executed with a split-second squirt of the nozzle. I've been coping by switching from cash to credit cards. Somehow it is easier to accept a fill-up costing over $40 by handing over the plastic than forking over paper. Have you noticed that people tend to say "I have to go to a funeral..." or "I have to go to a wake..."? This is understandable. But have you also noticed that we often catch ourselves saying, "I have to go to a wedding..."? Why is that? Perhaps it's because we're all tired of the same old routine, the absence of spontaneity, the obsession with perfection and capturing the moment in pictures and video which has become a big business. Ironically, the moment being saved ends up not being genuine and — boring. Sadly too, all the fuss is likely moot — unless the marriage is one of the few that defies the odds of divorce. Nevertheless, it would be nice to one day attend a marriage celebration that was truly that; and not unintentionally say, "I have to go..."
Please note that submitted comments will be reviewed prior to posting on this website.